Homepage. This page: Preparing to tour the Continent in the 1960s? then you needed a set of these. Ace G.B. chrome plated bootlid letters. If your idea of going on holiday in the 1960s revolved around eating ice cream at Skegness, or riding the donkeys at Blackpool, then this little motoring accessory wouldn't really seem much use. But if you set your sights on foreign soil, and planned a motoring trip 'en continente', then a set of GB letters stating your country of origin, was essential. A Ford Prefect belonging to spectators bound for the 24hr race at Le Mans, is seen here being loaded onto a ferry. This and other pics can be seen in the vintage car photos archive. 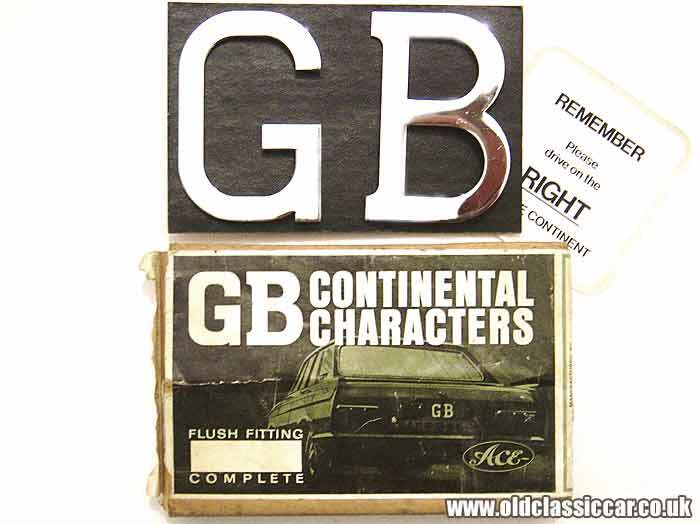 This particular set, boxed and untouched since the 1960s, is a flush fitting set marketed under the brand label of Ace, a name often associated with the old-style numberplates that proper cars once sported. The company that produced them was Cornercroft Engineering Ltd (Motor Accessories Division), who were situated at the Ace Works in Coventry. Unlike many of the modern reproduction G.B. letters that are available now, that stick on, these require the globetrotting motorist to drill four small holes into the bumper or bootlid of his cherished motorcar, to accomodate the threaded mounting pins. A steady hand with the drill was called for, otherwise a second visit to the spares counter would have been needed to buy some fresh enamel touch-up paint. A nice little touch is the sticker that came with the letters, designed to be stuck either on the dashboard or the inside of the windscreen, reminding the driver to drive on the right hand side of the road! 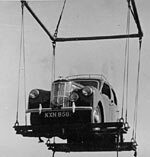 Return to my motoring gadget page within the vintage car accessory section at oldclassiccar.